Elder Scrolls V: Skyrim Dovahkiin Pop! Vinyl Figure - Funko - Elder Scrolls - Pop! Vinyl Figures - Born with the soul of a Dragon, embrace your inner Dovahkiin! 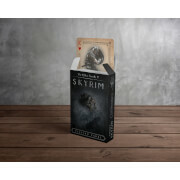 This Dragonborn warrior will bring the Elder Scrolls V: Skyrim video game to vinyl-life. The Elder Scrolls V: Skyrim Dovahkiin Pop! Vinyl Figure measures approximately 3 3/4-inches tall.